A light is one of the most powerful forces of magic. It can show you the way, it can offer solace in the darkness, and it can add heat and passion to virtually any situation. The flame of a candle is a simple thing, but with the right intention a candle can transform your life. Phoenix, the owner of Milk & Honey, runs a Candle Ministry offering candle services for a wide variety of needs, conditions, and spells. This service includes an emailed divination report on how the candle burned. A vigil light can help to improve love, luck, money, crossed conditions, career, or road opening in your life. Phoenix will set a 7-day vigil light, uniquely created for you. 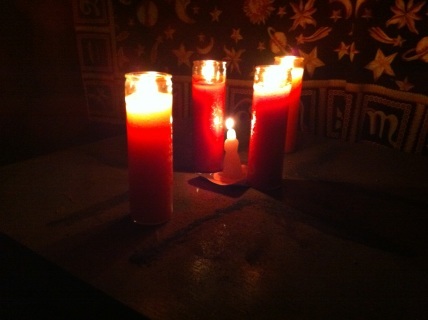 The fee for this service is $15 for the vigil candle and includes a divination report on how the candle burned. Make sure you include your email in your order.